At the monthly Wabash District #348 school board meeting Monday night, Superintendent Dr. Chuck Bleyer said he found that a fee designated for extra supplies wasn’t going to classroom supplies and instead was going into the district’s general fund…. In addition to doing away with the extra supplies’ fees, the school board voted to keep fees for the next year at the same level as the current school year. PRELIMINARY: Preliminary investigative details indicate Unit 1 was traveling northbound on I-57 at mile post 152 in Effingham County. Unit 2 was traveling in the same direction when it merged into the left lane to avoid IDOT work crews and reduced speed. Unit 1 failed to slow down and struck Unit 2 in the rear. Both drivers were transported to St. Anthony’s Hospital in Effingham. April 16th, 2019-Mt. Carmel Police were called to 231 N. Walnut Street in reference to two women in a physical altercation. Police arrived on scene and were told that Michelle L. Johnson, age 48, of Mt. Carmel, attacked another female after that woman paid for fuel. The police report stated the victim was attacked in the parking lot of the gas station and had to run back into the store to request help. Once inside the store, the victim reported that she was once again attacked by Johnson. The victim stated Johnson used a car key to stab her in the face and neck. An ambulance was called but the victim refused treatment. Johnson was transported to the Wabash County Jail where she was charged with 3 counts of aggravated battery. Johnson was held pending the posting of bond. April 16th, 2019- Mt. 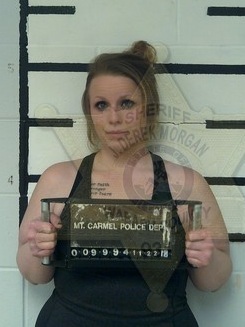 Carmel Police arrested 26 year old Kaleigh C. Singer of Mt. Carmel on a Wabash County failure to appear warrant. Singer was located in the 100 block of W. 9th Street in Mt. Carmel and placed into custody. Police transported Singer to the Wabash County Jail where she was held pending the posting of bond. Thursday, April 25, 2019 8:00 a.m. The Board of Trustees of the Illinois Eastern Community College District No. 529 reorganized for the next two years, at the regular meeting, Tuesday, April 16, at Lincoln Trail College, Robinson. Following adoption of a resolution for the election returns of April 2, the oath of office was administered to trustees Al Henager, Mt. Carmel, John Brooks, Robinson, and James Lane, Robinson. Trustees Henager and Brooks were seated for six-year terms, expiring in 2025 and James Lane was seated to fill the remaining 2 years of an unexpired six-year term, expiring in 2021. The oath of office was also administered to Corey Hall, who was seated for a one-year term as student member of the Board of Trustees. A student at Lincoln Trail College, he succeeds student trustee Haylee Neuman. Trustee G. Andrew Fischer was re-elected Chairman of the Board of Trustees, and Trustee Brenda Culver was elected Vice-Chairman. Trustee Gary Carter was appointed Secretary Pro Tempore. Ryan Hawkins was re-appointed District Treasurer. Renee Smith was re-appointed Board Secretary and District Ethics Officer. All of the officers were elected unanimously. Action was taken to adopt all rules, regulations, policies and actions of prior Boards of Trustees. Trustees approved two articulation agreements between IECC and Southern Illinois University at Carbondale in the area of Accounting and with Chamberlain University in the area of Nursing. These agreements facilitate the smooth transfer from IECC’s programs to the universities’ Programs. Acceptance of two parcels of property was approved by the Board. The Lincoln Trail College Foundation has conveyed 11 acres of property for use by LTC for a soccer field. Lincoln Trail has also received a real estate gift of property that is located at 303 East Cherry Street in Robinson. Trustees also approved a renovation and expansion project to LTC’s Zwermann Arts Center. The project will be funded with local contributions. Activity Fee allocations for 2019-2020 were approved for FCC, LTC, OCC and WVC. The Board adopts the allocation of student activity fees at the colleges each year. The allocation notes what percentage of each dollar will be turned over to an appropriate self-balancing account in the auxiliary fund. An affiliation agreement was approved with Harmon’s Pharmacy of Oblong for LTC’s Pharmacy Technician Program. Trustees approved an agreement between IECC and area high schools that satisfies a state mandate with the goal of improving the transition from high school to college or work by reducing the number of students who need math remediation coursework in college. The Board received a status report on the Identity Theft Prevention Program and a report on the upcoming HLC Year 4 Assurance Argument Review. An Honors Program was approved for high achieving IECC students. The Honors Program has been developed to provide learning opportunities to talented students who seek intellectual and cultural growth through enriched academic experiences. Contracts were renewed for two years for CEO Terry Bruce, FCC President Jay Edgren, LTC President Ryan Gower, OCC President Rodney Ranes, and WVC President Matt Fowler. A resignation ratification was approved for Jamie Henry, Director of Business at Lincoln Trail College, effective May 4. Trail College, effective June 1 and for Cheryl Holder, Director of Adult Education at Frontier Community College, effective July 1. Next regular meeting of the Board of Trustees will be Tuesday, May 21, at 7 p.m. at Olney Central College, Olney. Photo Left to Right: Chairman Andrew Fischer, Paula Hall, Corey Hall, Chip Hall, Trustee John Brooks, Trustee James Lane, and Trustee Al Henager.